The toll that structural violence takes upon disadvantaged people in NZ was highlighted in a keynote address to the Public Health Association of Australia’s annual conference in Melbourne last week. Darrin Hodgetts, Professor of Societal Psychology at the University of Waikato, described how punitive welfare reforms exacerbate the difficulties faced by many people who are already struggling, and said that state agencies increasingly enact repression rather than care. 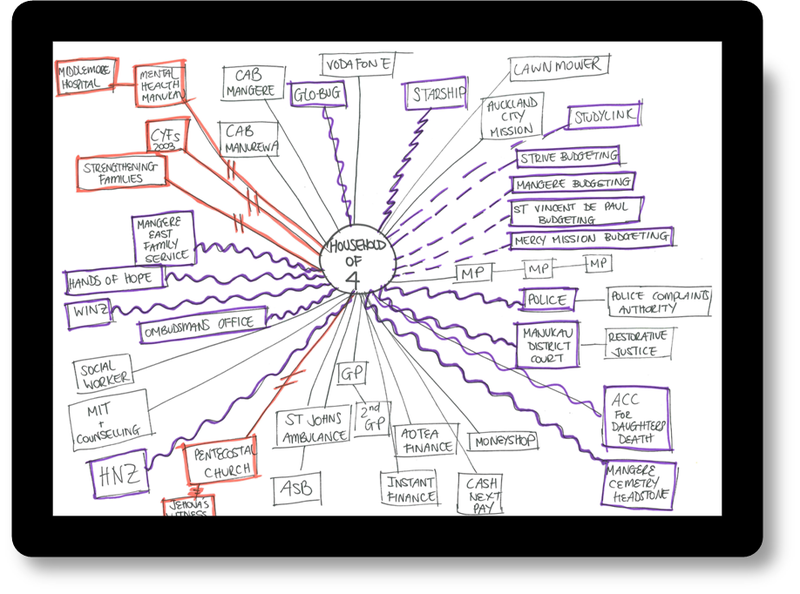 New Zealand social scientist Darrin Hodgetts says the diagram below maps the “chaotic landscape of despair” that defines the daily lives of an increasing number of poor New Zealanders. It tracks all the interactions that one family had with government agencies, not-for-profit community services, and private providers, over a two week period. As he says, it is a full-time ‘job’ for at least one family member to try to navigate such an obstacle course (Click on image for more detail). Hodgetts says the proportion of New Zealanders officially living in poverty has doubled to 12 per cent of households over the past two decades. The same period, he says, has seen the systematic dismantling and privatisation of state welfare supports. Emergency grants for food and housing can only be given with evidence of a budget audit of a family’s accounts to ensure they are not wasting money on alcohol or cigarettes. 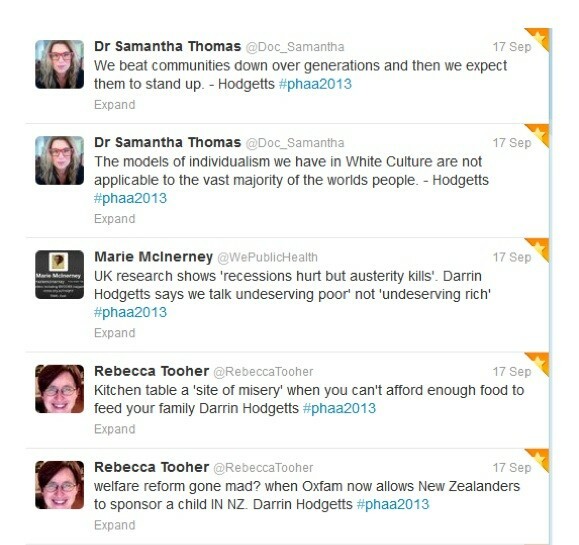 Hodgetts, Professor of Societal Psychology at the University of Waikato, drew examples from the Auckland City Mission Family 100 project, which explores how 100 families who have been accessing the Mission’s food bank with high regularity make sense of and respond to their situations. The cohort consisted of 40 per cent Maori, 25 per cent Pacific Islander, 22 per cent European, and 13 per cent Asian and other minority groups. He admits some researchers would have ethical concerns about the project’s decision to provide the families with regular food parcels for a year in exchange for them speaking frankly with social workers about their experiences every two weeks. He doesn’t share the concerns: “It’s based around reciprocity. If you have people who don’t have enough to eat and you don’t reciprocate for sake of the concerns of a minority of researchers around inducements, then you’re involved in ‘poverty tourism’,” he says. 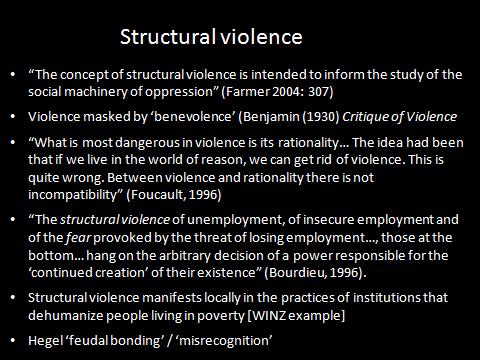 In looking at the information gathered, the project employed the concept of structural violence, which was developed to examine colonialism, but which Hodgetts believes can equally be used to look at neo-liberalism. (Click on image below for more detail). The aim was to ‘give voice’ to participants, but also to draw on theoretical knowledge and abductive reasoning to interpet family accounts. “We need to situate these accounts systemically in order to understand the everyday lives and dilemmas of families as well as the lack of care and violence of the New Zealand government towards families in need,” he said. Participants’ relationships with staff at Work and Income New Zealand (WINZ), the equivalent of CentreLink, frequently resulted in mistrust, fear, helplessness, distress, indignity and avoidance, he said. The result? “Children go hungry and their parents are afraid of seeking assistance from WINZ; they don’t raise certain topics for fear of repercussions, they feel they can’t do anything right, that they deserve to be treated adversely, that it’s their problem, their fault, and they often experience helplessness,” he said. Hodgetts says the stories of participants showed WINZ staff as quick to punish transgressions but unaccountable for their own errors. Nor will they volunteer information about participants’ entitlements. ‘If you don’t ask, you won’t get it,’ one participant told the project. • Read more about the project. 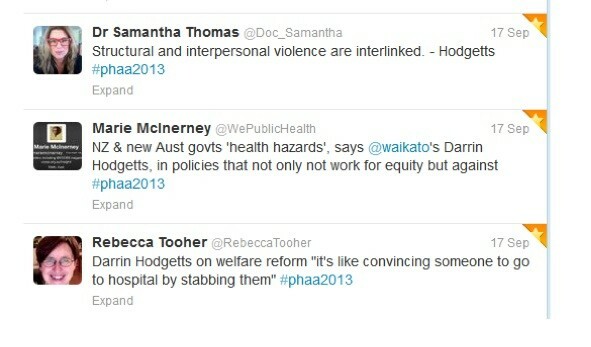 • You can track all of Croakey’s #PHAA2013 coverage here.